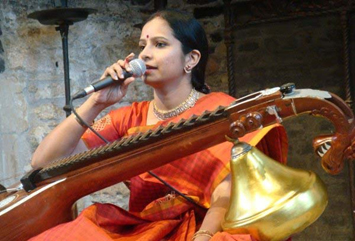 Jayanthi’s solo concerts showcase her rich repertoire through the pure melody of Veena with percussion accompaniment. 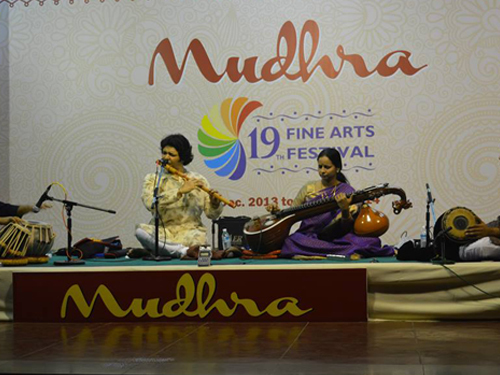 A typical Solo Veena concert features two percussionists on the Mridangam and Ghatam (or Kanjira/Morching) accompanying the Veena. The rich tone of Veena is embellished by the gentle strokes on the Mridangam and earthy tones of the Ghatam. Jayanthi has been playing this type of Solo Veena concerts for the last 30 years and has won much acclaim all of the world for her engaging, fulfilling and enthralling concerts. 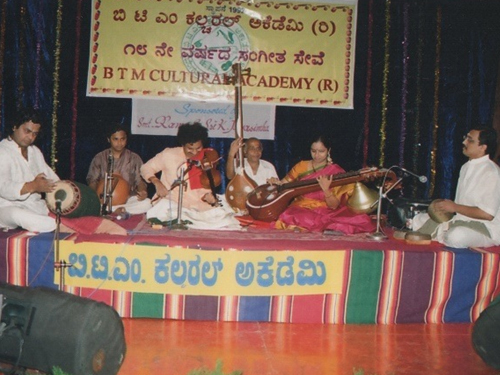 Besides her solo concerts, Jayanthi also performs as a team with her husband, violin maestro Shri. R. Kumaresh (of the Ganesh-Kumaresh duo) to present “Strings Attached”, a collaborative production by two very innovative, expressive and exciting artists of Carnatic music. “Strings Attached” gives a lot of importance to improvisation, creativity and exploration of ragas. A child prodigy who started performing when he was barely 5, Shri. Kumaresh has 43 years of extraordinary concert experience. He has performed with legends of different genres and believes that every musician should pave his own path in expression of musical ideas. The continuity of the Violin combines with the aesthetic ornamentation of Veena and makes for a refreshingly different listening experience. The music by this husband wife duo is a rich experience of tonal variations spontaneity and brilliance. The “Strings Attached” ensemble also works in tandem with a storyteller who presents concepts in Carnatic music and personal stories of the artistes and their instruments in a way best suited for young children to absorb, learn and be entertained. This Children’s special concert is a very specially conceived production for the young audience. 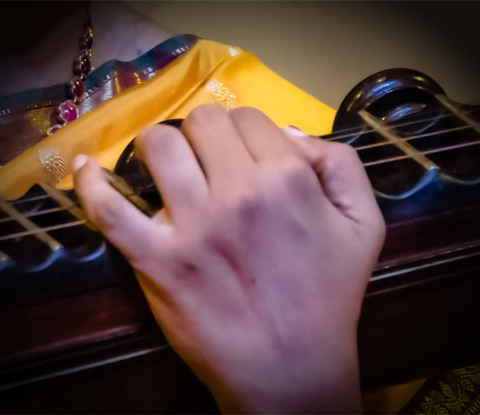 Jayanthi’s Veena playing is characterized by a variety of approaches and an intuitive understanding of the scope of veena as the most expressive instrument to carry the spirit of Carnatic music. Jayanthi brings out the versatility of the Saraswathi Veena through her jugalbandhis and collaborations of Carnatic classical on the Veena with other genres of music including Hindusani classical, Western classical to name a few. 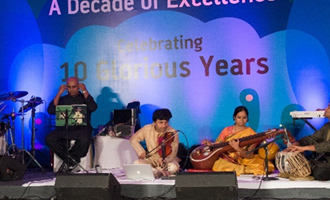 Indian Spice is a band founded by Jayanthi that draws a bridge between Classical and contemporary music. Neo-classical in nature, this band brings together a collaboration of artistes from classical and contemporary genres of music. Jayanthi on the veena and Shri.Kumaresh on the violin will explore ragas with creativity and improvisation. The addition of keyboards brings harmony to the mix and the combination of Creative percussions and Tabla is another play at combining traditional with contemporary. The need to unite the country musically, to make a comprehensive representation of the country’s musical heritage and to have national body consisting of prominent musicians to perform in one voice and one purpose was the instigation behind Jayanthi’s brainchild – Indian National Orchestra (INO). 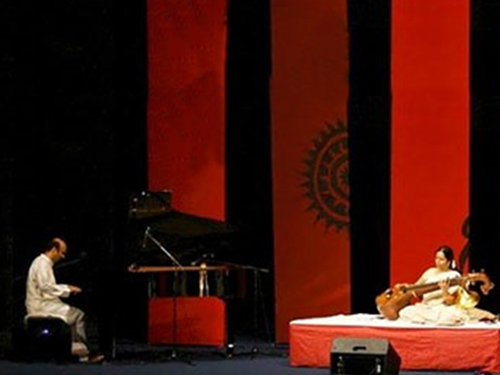 The INO brings under its fold about 21 artists who are the best in their fields, but are bound by one common passion and mission—to provide a platform for espousing the best that Indian classical music has to offer in the 21st Century. The Indian National Orchestra (INO) had its first ever concert in Chennai on the 25st of June 2011. 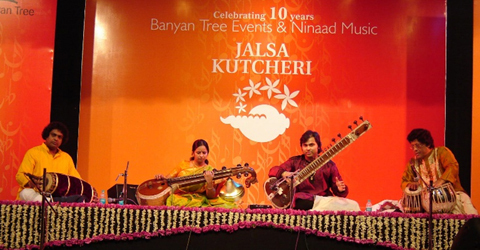 They have subsequently performed in several important venues all over India. The INO consists of extraordinary artistes from pan India covering both North Indian and South India classical music forms. Hence the music presented by INO will truly reflect India, as it is today—diverse in texture and variety, but united in spirit and purpose! 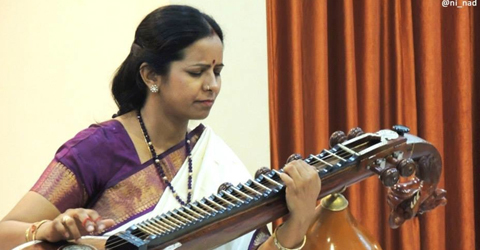 With a doctorate in Veena Jayanthi is able to enunciate the theoretical, historical, etymological and practical aspects of the Veena and the art of Veena playing. 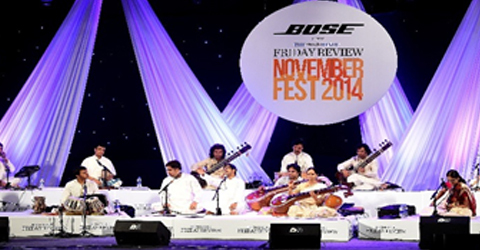 Jayanthi has travelled far and wide to promote Indian Music and culture, in India and abroad. Her passion for music and the veena, and her years of training and research have made her lecture demonstrations and workshops a wonderful learning experience for the listener. 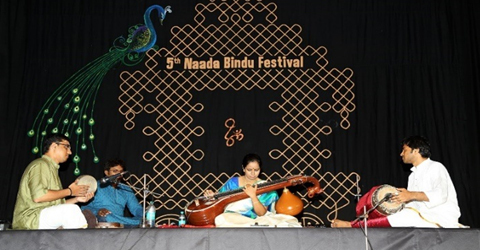 “Origin and evolution of Veena”, “Veena – past, present and future”, “Introduction to Indian classical music” are a sample of the type of topics she has covered in the past. Just Me is a new series of concerts where Jayanthi weaves an embroidery of 45 different ragas on the Veena with no compositions or accompaniments – just her creativity to take the listeners through a serene and meditative raga journey. Usually in Carnatic Music instrumental concerts it is believed that percussion enhances the rhythmic melody. As a result one single musical idea is either enhanced or modified by multiple interpretations given by the individual artistes on stage. This is a phenomenon which has continued for so many years now. But at the same time when an artiste performs alone (ALONE literally) there are other dimensions/facets of the instrument and the musician, that may not manifest itself when there are other instruments. Also there are many subtle overtones and undertones that makes an instrument what it is and it doesn’t quite get heard when there are other instruments. This concept will ensure that every musical idea of the solo artiste is conveyed exclusively. Story in Concert is yet another unique attempt of Jayanthi where she collaborates with a story teller, painter and percussionists and presents a story that is inspiring at different levels for varied age groups. The story is woven into the structure of the concert and unfolds itself in layers through the Music, storytelling and painting thereby making it a very rich experience for audiences at different levels.